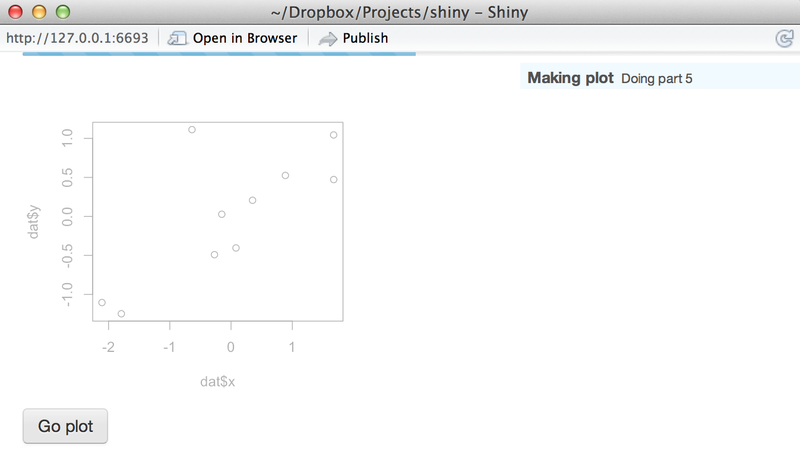 This version of Shiny requires R 3.0.0 or higher (note the current version of R is 3.1.1). R 2.15.x is no longer supported. File uploading via fileInput() now works for Internet Explorer 8 and 9. Note, however, that IE 8⁄9 do not support multiple files from a single file input. If you need to upload multiple files, you must use one file input for each file. Unlike in modern web browsers, no progress bar will display when uploading files in IE 8⁄9. See the single-file app article for more. Read the progress bar article for more. Searching in DataTables is case-insensitive and the search strings are not treated as regular expressions by default now. If you want case-sensitive searching or regular expressions, you can use the configuration options search$caseInsensitive and search$regex, e.g. renderDataTable(..., options = list(search = list(caseInsensitve = FALSE, regex = TRUE))). Shiny has switched from reference classes to R6. Reactive log performance has been greatly improved. Exported createWebDependency. It takes an htmltools::htmlDependency object and makes it available over Shiny’s built-in web server. Custom output bindings can now render htmltools::htmlDependency objects at runtime using Shiny.renderDependencies(). Please read the NEWS file for a complete list of changes, and let us know if you have any comments or questions.